We know that good design is not limited by the project delivery system; it has been delivered under many different scenarios including Design/Bid/Build, CM, CM at Risk, Bridging and Design/Build. Quality design is an iterative process that takes into account the client’s program and desires and then presents solutions that optimize as many of these factors as possible given the site, context, program and budget. This process can take varying amounts of time depending on the complexity of the project. The reason many clients first consider the design/build process is speed, when the delivery date becomes the most important project driver. As construction is a sequential process and can only be speeded up so much, it is usually the design phase that gets shortened. This can result in a simpler design solution with less refinement because the design time has been cut, or maybe an early package is now an existing condition that limits the possible solutions. These compromises are often the prevailing perception of Design/Build, but we see it another way. DiMella Shaffer has chosen to embrace Design/Build as a way to deliver good design. We can have an extended design dialogue with the contractors and subcontractors, which are jointly responsible to the client, we find that they pay more attention to the process. We also discover that once they understand the basis behind the important design decisions, the contractors often have greater insights into how to accomplish them better or faster. They also appreciate being respected for their knowledge and the expertise they provide early in this process. 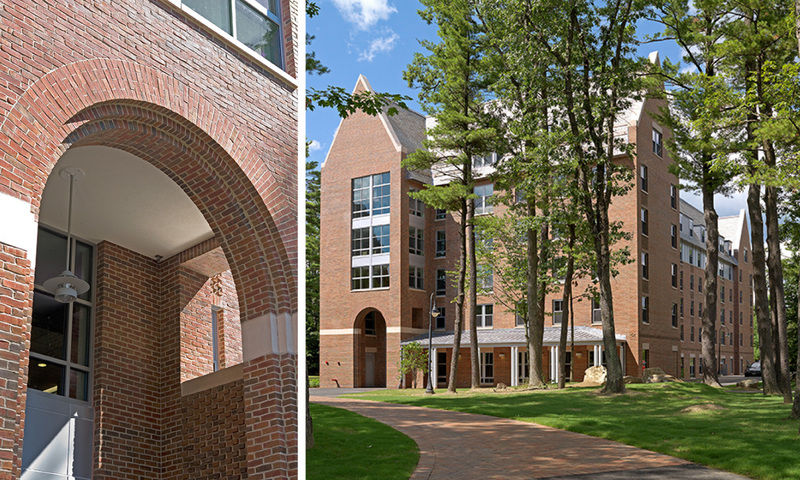 The mason we worked with at the University of New Hampshire said he would work for less money if he was treated with respect and involved in the execution of his trade the way he was on The Gables project. On the same project, it was the contractor‘s project manager who suggested building on the north parking lot, which added relocating a 300-car parking lot into our schedule. He saw the strategic value of mobilizing on two sites and being able to stagger the trades with separate crews as a way to maximize the construction efficiency. While we saw the value of building on both the north and south of the existing complex from an architectural point of view, we hesitated to suggest it, understanding the delivery schedule implications of adding the scope of a new parking lot. But here, the person on the team with the best handle on the delivery schedule saw the value in the design and found a way to see the opportunities created in the schedule as helping to speed the construction delivery. For good design to occur in the Design/Build framework, it is imperative that the designer be in dialogue with the client, regardless of the contractual relationship. This is the only way that DiMella Shaffer will do Design/Build. That communication is critical to appropriately solving the architectural challenges of the project. The architect brings great skill to the process in dealing with the “grayness” of various issues. It is rare that things are black and white in architecture and construction, so the ability to balance the issues is critical to the success of the project. This direct dialogue with the client allows the architect to hone his understanding of the client’s goals and to help the construction team navigate those decisions to meet the client’s expectations. The owner also has an important role in achieving good design in a Design/Build project. They should establish and reinforce the level of quality and design that they desire. They should talk about this as much as they talk about cost. In a typical project, there is probably ten times as much dialogue from the owner about cost as there is about design/quality. 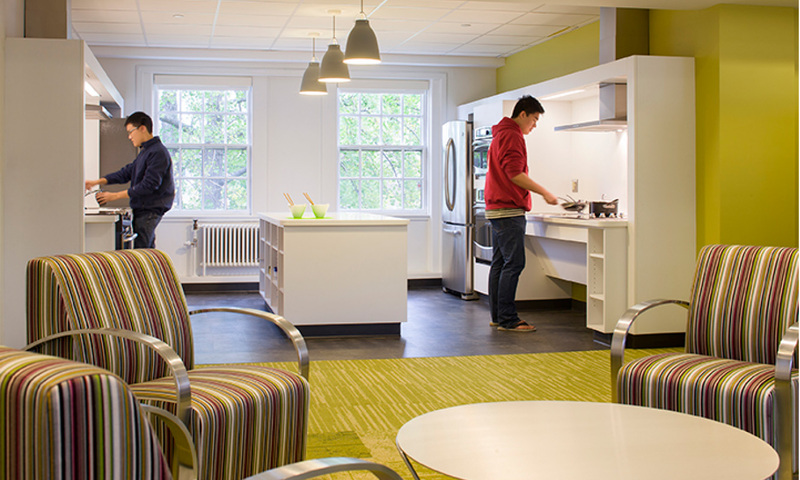 The key to Design/Build is value–achieving the best and highest quality project for the allocated dollars. It is a natural tendency for most contractors to want to accomplish the project for less money as an objective measure of success because they are only responsible for the cost. In Design/Build, the contractor, by holding the contract for the whole construction team, is also responsible to the owner for the design, so it is important for them to understand what the owner views as design success and project success. This usually means good design for the budget, not good design and over budget, or mediocre design and under budget. The Design Solution Phase allows the Design/Build team to work collaboratively with the owner to establish the right balance of design and budget before proceeding to construct the project. It has been a growing trend across many industries that cost savings result from the consolidation of the supply chain. Construction in the U.S. is one of the most fragmented supply chains in existence that has traditionally defied consolidation. Design/Build begins to consolidate the supply chain by combining the architect, sub-consultants, contractor and subcontractors together. They are all on the same team to deliver the project that the owner desires. This does a couple of things. It reduces the traditional three party contracts to two, and the architect and the contractor are responsible for both the quality of the design and the budget. More important is that the control of both is together in one contract. Each party is forced to engage in the discipline of the other to a greater depth than is common in a typical project. It is not uncommon in a typical delivery system for the main design ideas to be the first items brought up on the value engineering list, but this is detrimental to the process. In Design/Build the contractor comes to understand and even champion the design because he is partially responsible for it and he was there when it was created. At The Gables project, the Construction Project Manager was able to successfully explain and defend the design significance of a false column in the lobby that the owner wanted to remove during construction. Another result of this teaming arrangement is that “friction dollars” become available to the project for quality improvements. We all know that construction projects have many layers of built-in contingency, including dollars for missed scope, lack of trust, schedule risk, working with difficult subs or CM’s, and just because one might need three more fittings. A Design/Build team is usually choosing to work together, has built up a level of trust, and because they are on the same team, can have better dialogue about issues that may be causing risk to one party or another. This reduces the need to compensate for everything with “friction dollars,” the money it costs to work with other people. Another potential for savings more easily accomplished in Design/Build involve issues concerning constructability. The design and construction process has many opportunities to accomplish the same objective in different ways. Having the subcontractors work closely with the architects allows them to better understand the design and therefore to be creative in how things are eventually constructed. Because this process happens up front, it creates more opportunities for savings than in a typical job. The subcontractor typically approaches these issues while the building is under construction, after the architect has already chosen a way to accomplish the design, so when a different method or detail is proposed, it may affect other trades and this ripple effect increases the cost of the job. “Friction dollars” appear because someone’s anticipated approach to the project needs to change. It should not be lost on owners that these Design/Build projects are completed without change orders, with the exception being owner added scope after the design phase and GMP agreement. 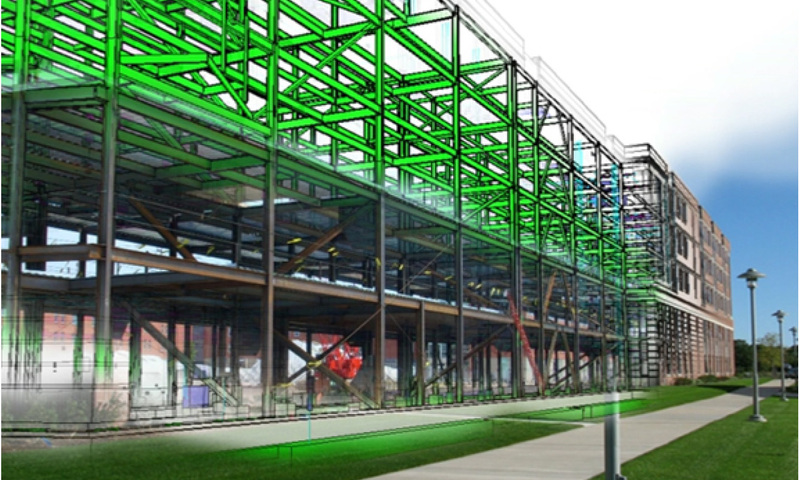 Building Information Modeling (BIM) is beginning to help in this process because the 3-D model of the building makes the design more understandable at earlier phases than two-dimensional drawings. One element of Design/Build is that there is usually a greater interaction among the architect/sub-consultant team and the selected subcontractors. BIM is going to facilitate this interaction even more because the design model will eventually become the basis of the shop drawings. For example, the architect will establish the curtain wall profiles and the subcontractor will take this and add fabrication data and details. The architect will review for conformance with the design intent and when approved, it will be able to go directly to fabrication. Thus the supply chain discussed above is shortened by a few links. In the future, building materials may come with RFID tags linked to the model so that the contractor knows when they arrive on site and where they will be stored. Those missing hollow metal frames lost under the electrician’s trailer could now be easily found, saving the need to reorder with a rush charge. 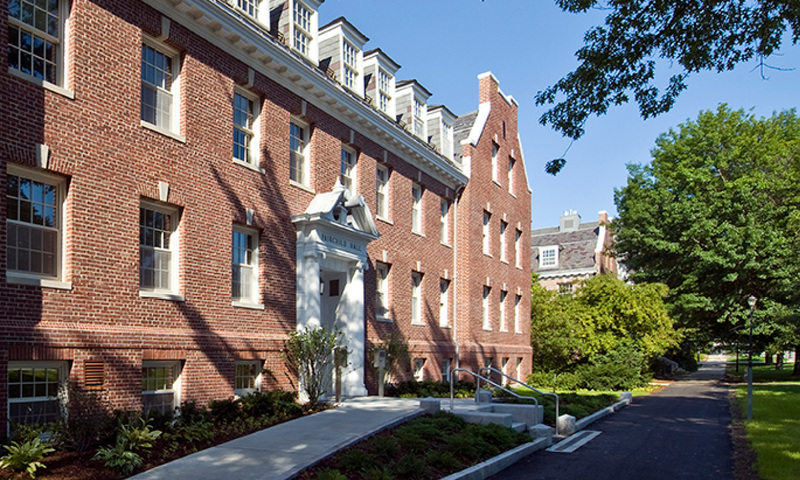 Fairchild Hall, University of New Hampshire, $7.5 million Design/Build gut renovation of early 20th century residence hall with Cutler, Inc.
As these examples show, Design/Build actually contributes to achieving good design, and in the best examples it will enhance the design. Much of its success comes from the increased communication within the design and construction team and the team’s exposure to the owner who clearly articulates the design goals for the project. It requires a good architect and a good contractor that willingly step confidently across the aisle to understand the project’s issues holistically and solve them that way as well. While the exact nature of the consolidation of the supply chain in the construction industry remains to be determined, DiMella Shaffer is embracing the Design/Build delivery system, having completed over $200 million of projects in the last ten years and continuing to explore other ways to provide design excellence and increased value to the owner.